Sam & Dr. Judy Wright are former public school teachers and university professors in kinesiology, dance educators, dance instructors, dance competitors, and dance/physical education coaches who promote line dancing, social dancing, fun, and physical fitness for all! They apply their knowledge of pedagogy to facilitate the learning process for students and especially beginners to help them get started the “Wright Way”—via a continuum of learning experiences and concepts designed for successful personal accomplishments, enhanced confidence, and enjoyment by understanding the why behind the moves and how to make good decisions on the dance floor. Our goal is to prepare independent learners who can feel confident on the dance floor and know how to problem solve effectively. Two-for-one deal: Sam and Judy Wright give you both male and female perspectives on footwork, proper technique, styling tips, turning, leading, and following. As dance educators, they specialize in breaking down skills to make it easy for you to learn new dances and moves. Sam Wright has a M.A. degree and taught physical education, dance, history, social studies, and driver education at the middle and high school level for over 25 years. He coached five different sports (i.e., football, basketball, softball, track and field, and golf) with winning teams and was inducted into the Illinois Hall of Fame as both a player and a coach. Sam played semi-pro basketball and baseball for 10 years. He utilizes the part-whole teaching method to break down skills especially for men—similar to doing football drills. Judy Wright has a Ph.D. degree and taught physical education and dance at three different universities for over 13 years (Walsh College, North Canton, Ohio; the University of Illinois, Urbana-Champaign; and the University of Tennessee at Chattanooga). Her dance experience includes 13 years of tap, jazz, modern, ballet, social, folk, square, country Western, line, and aerobic dance. She has taught dance at the junior high, high school, college, and community levels since 1971. ​In Ohio, Judy had her own baton twirling studio for over 10 years and won over 400 trophies, including being named Miss Majorette of Ohio, Ohio State Twirling Champion, Ohio State Strutting Champion, Ohio State Military Strutting Champion, and Miss Greater Akron in the Miss America Pageant. She was a baton twirling judge and the director of the Royale Ju-Dells an 85-member drum and baton corps who were Senior National Parade Corps Champions in 1970. Based on her dissertation research, Dr. Wright developed the format for the Steps to Success Activity Series, the #1 Sports Instruction Series at Human Kinetics Publishers with over 25 different sports, and over 100,000 copies sold worldwide. She also developed the first two student high school dance textbooks that were adopted by the state of Texas. Sam and Judy joined forces to co-teach the dance rhythms course for kinesiology majors at the University of Illinois, Urbana-Champaign, for five semesters, where they trained future teachers to teach a wide variety of dance forms in the schools, including basic rhythms, introductory mixers, and material for three-week units in line dances, seven different couples’ dances, aerobic dance-exercise, and folk dancing. They also taught ballroom, hustle, salsa, and swing classes at Richland Community College, Decatur, IL, for over four years. They have presented numerous workshops locally as well as at the state and national levels for the American Alliance for Health, Physical Education, and Dance (now re-named SHAPE America), the National Teachers Association for Country Western Dance Instructors, the National Dance Education Organization, and the National Dance Society. Currently, Judy is the Editor-in-Chief of the National Dance Society Journal, and both Sam and Judy are USA Dance social dance instructors. Judy is the author of Social Dance: Steps to Success, Third Edition, published in 2013 by Human Kinetics. It is a complete instructional package that includes a 394 page, four-color book, a CD of practice music, and a 93-minute DVD outlining the learning progressions for 10 different couple’s dances as follows: Merengue, Four-count swing/hustle, Waltz, Six-count swing (includes East Coast Swing), Foxtrot, Polka, Cha-cha, Rumba, Tango, and Salsa/Mambo. While in Mahomet, Illinois, they opened the Wright Way Dance Studio in their home, were guest artists in the schools, and also taught on cruise ships. In 2010, they moved to Monroe, NC, taught group social dance classes in Charlotte, NC, for 4-1/2 years. In the fall of 2015, they moved to Morganton, NC. In January 2016, they began teaching line and social dance classes for the Valdese Parks and Recreation Department at the Old Rock School in Valdese. Known as the Wright Way Dance Instructors, their popular classes in both line dance and couples’ dances are beginner friendly with safe progressions for improving stamina, efficiency of movement, and building confidence. 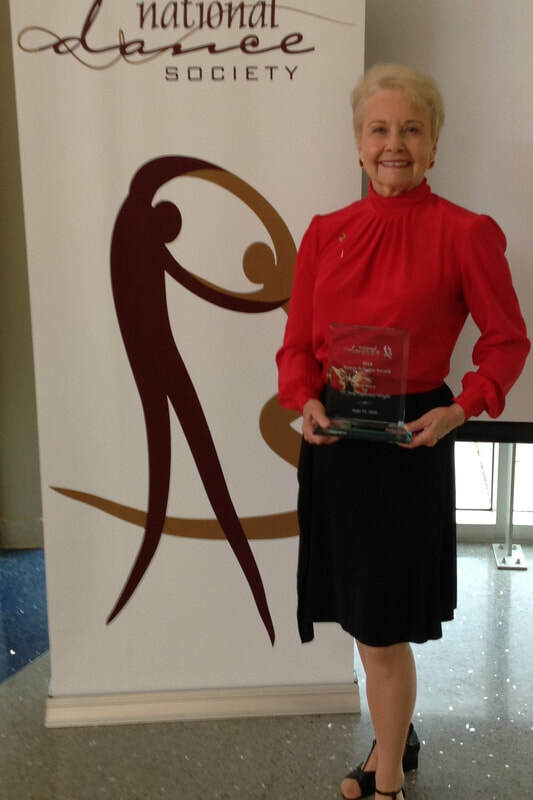 On June 23, Judy received the 2018 Dance Scholar Award from the National Dance Society in Virginia Beach, VA. This award recognizes dance educators who have been producing scholarly/creative works of significance to the community, state, regional, national, or international levels. During Dr. Wright's 23 years as a developmental and acquisitions editor at Human Kinetics Publishers in Champaign, IL, she pioneered more than 125 books related to dance education, pedagogy, kinesiology, motor behavior, and aging and physical activity. She created the format for the "Steps to Success Activity Series" currently sold world wide as the No. 1 sports instructional series, of which her book, "Social Dance: Steps to Success, Third Edition," is a part. As editor-in-chief, she created a new academic journal, mentored authors to write articles, prepared submission guidelines, internally reviewed and coordinated the manuscript flow process for the first two volumes of the "National Dance Society Journal" (published in the summer of 2016 and 2017). Currently married for 36 years, Sam and Judy enjoy teaching and promoting the joy of social dancing—for a lifetime of fun! Sam and Judy Wright met in the disco era when Sam was teaching disco in the community and for his high school students, and Judy was teaching two levels of ballroom dance at the University of Illinois, Urbana-Champaign. Their partnership blends the smoothness from ballroom with the excitement of disco. The hustle is one of their favorite dances still today! In both 1996 and 1997, they finished second overall at the World dance finals. They were the 1997 U.C.W.D.C. World Silver Advanced Showcase Cha-Cha Champions. After a break from competition, they returned to American classic competitions in 2007. In 2009, they earned the U.C.W.D.C. World Overall Gold Combined Division Championship title having won 5 firsts (West Coast Swing, Waltz, Polka, Country Two Step, and Cha-Cha), 2 seconds (East Coast Swing, Hustle), and 1 third (Night Club Two Step). ​In January 2012, they won first place in the Masters Strictly Swing (i.e., West Coast Swing) and in the Masters Strictly Hustle divisions. Since 2014, Judy has won numerous firsts in line dance competitions. ​In September 2016, they resumed competition in six dances for three competitions until an injury halted practice. Judy has done some additional line dance competitions in 2017 and 2018. ​Currently, they are focusing on social dancing and teaching dance for now--it is a passion--we both love to dance and to teach!